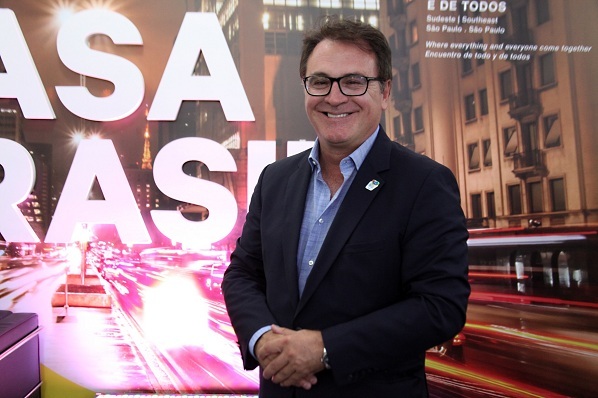 As Rio de Janeiro approaches the end of a broadly successful Olympic Games, Breaking Travel News here sits down with the president of Embratur, Vinicius Lummertz, to discuss how the national tourist board expects the event to impact on travel to the country. On the agenda are the costs of hosting such an event, the benefits, and how the organisation hopes to balance the two. Breaking Travel News: The positive impact of hosting major events such as the Olympic Games and FIFA World Cup has been questioned in recent years. How do you expect Rio’s hosting of the 2016 Olympic Games to impact on tourism in Brazil? Vinicius Lummertz: We are very optimistic about the great impact that hosting the world’s biggest sporting event in Brazil will have on tourism in our country. Our expectations are high, not least because the Anuário Estatístico do Turismo (Statistical Yearbook of Tourism) indicates that in 2015 Brazil maintained the same flow of foreign tourists as the previous year, when the World Cup took place in Brazil and a record number of foreign visitors were registered. Over 6.3 million people arrived in the country in 2015, giving a volume just 1.9 per cent down on 2014. According to Central Bank data, in the first six months of 2016, tourism revenues in Brazil grew by seven per cent compared to the same period in 2015. At the same time, the country’s economy as a whole showed a decrease of 3.5 per cent. The numbers demonstrate the vigour and sustainability of the tourism sector, which has an impact on 53 segments and favours the recovery of national economic growth. Solely for the Olympic Games, we expect to receive between 300,000 to 500,000 foreign tourists. BTN: Do you feel the cost of hosting such an event outweighs the opportunity cost of other investments, especially during a time recession for Brazil? VL: Besides improving the perception of Brazil and increasing awareness of the diversity of the Brazilian people, the success of the large events we have held in past years, culminating with the Olympic Games, will help to increase the influence that tourism has on Brazil’s economic development. The total investment in the Olympic Games was $US11 billion, 57 per cent from the private sector and 43 per cent from the public sector. For every R$1 invested in sports facilities, another R$5 are applied in projects for the city that shall remain as a legacy for locals and tourists. Just to give you an idea, hosting the World Cup in 2014 helped to create a new record to Brazil in terms of international currency, bringing to the country US$1.578 billion in foreign currency during the tournament, according to data from the Central Bank. We hope to repeat the success with the Olympic Games. BTN: What do you feel the mid- to long-term impact of the event will be on Brazilian tourism? VL: At the end of the series of mega-events held in Brazil, (starting with the Pan-American Cup in 2007, followed by Rio+20, World Youth Day, the Confederations Cup, the World Cup and the Olympic Games) Brazil will have benefitted from ample exposure to the outside world and the building of both basic and touristic infrastructure. In total, the eyes of five billion spectators from all over the world will be on Brazil during Rio 2016. It will be a unique opportunity to highlight some of the Brazilian destinations which have less global visibility. The infrastructure built for the Games will be a vital legacy for improving the reception given to tourists in Brazil, particularly in terms of airports, urban mobility, tourism signage and qualified personnel. All this will deeply benefit Brazilian Tourism now and in the future. Our plan is to use the big exposure to increase awareness about Brazil and promote not only the iconic cities such as Rio de Janeiro and São Paulo, but destinations with less visibility. It is also important to highlight that the infrastructure built for the sporting events will be a vital legacy for improving the reception given to tourists in Brazil, particularly in terms of airports, urban mobility, tourism signage and qualified personnel. This improvement, together with the devaluation of the Brazilian currency, is greatly helping to attract larger numbers of tourists to Brazil in years to come. BTN: You have taken the opportunity of hosting the Olympic Games to re-launch the VisitBrasil website. Can you tell us a little more about that? VL: Internet is the main research source of information for travel planning. Therefore, Embratur has been working intensely to create a digital ambience aiming to provide easy, accessible and accurate information to foreigners about Brazil. We believe digital tools can deeply contribute to increase the number of tourists in our country. Considering this trend, Embratur is launching a new version of the official website visitbrasil.com, which will be available in many different languages. Embratur is also working on content sharing on their social channels such as Facebook, Instagram and YouTube. Digital influencers are now playing a big role in the way we are promoting Brazil Internationally. In addition, we have been doing an intense work focused on tour operators aiming to increase the number of operators that are qualified to commercialize Brazil with excellence. This includes different activities such as workshops, road shows and online trainings. BTN: The world knows about Rio’s carnival and the commercial buzz of São Paulo, but what other areas of the country do you hope to showcase in the coming weeks and months? VL: With its beautiful scenery and many national and state parks, Brazil ranks highly in terms of using its natural resources to boost tourism. However, Brazil is home to much more than beautiful scenery. Brazil has a unique and vibrant culture. According to a recent survey in the aftermath of the World Cup, the number one thing that was appreciated by international tourists during the World Cup was the warmth of the Brazilian people. The same can be said of the Olympics. Despite not speaking English as a first language, the Brazilian people are open-minded and want to reach out to tourists. There is a freshness in Brazil of attitudes and optimism that make us unique. For those who want to escape the buzz and are looking for a more relaxed holiday, an ecotourism tour would be a good option. The Amazon rainforest is globally renowned for its staggering size and eco diversity. August and September are the best time to visit the Amazon, as the country is in dry season. The water level in the Amazon River is highest and the weather is mild and clear. Visit the depths of the Amazon by travelling by Riverboat and or hiking between jungle lodges. The main gateway is the city of Manaus. Brazil is also an emerging destination in the luxury market. Foz do Iguaçu, the city in the Southern Brazilian state of Paraná, is world famous for its impressive waterfalls, the “Cataratas do Iguaçu”, falling down an average of 72 meters. There, a helicopter flight or an exclusive rafting tour will become a memorable experience. The city itself is a perfect starting point to explore the beauty of the surrounding nature. The Iguaçu National Park covers 185,000 hectares, which have already been named World Heritage by the UNESCO in 1986. Passionate golfers get their money’s worth at the Golf Club Foz do Iguaçu. A professionally and flawlessly kept place of “Bermuda grass” and night lighting attract numerous tourists every year. Brazil is a continental country, providing options for all tourists, accommodating to all tastes and budgets. Embratur, also known as the Brazilian Tourist Board, is a federal, state-owned agency reporting to the Brazilian Ministry of Tourism. It was formed in 1966 and works exclusively on the promotion, marketing and supporting to the trading of services, products and tourist destinations of Brazil abroad.